Please contact me if you encounter any bugs or have any questions! What makes this Skript obfuscator special? - It is not a plugin. After using the program to obfuscate your skript, the skript can be used on your server right away, no extra dependency plugin is required to read it because skript options are utilized for the obfuscation. The downside of not having a third party plugin for obfuscation is that the obfuscation is much easier to crack. The people that this plugin aims to deter are inexperienced thieves who will open your skript, see code that looks something like the image below, and become very confused. To further protect your skript, there is an option to encapsulate it in a jar (more details below). Classic obfuscation is the original obfuscation technique and provides adequate protection from amateur skript thieves. There is also a lite obfuscation option which will significantly reduce the size of your obfuscated skript; however, it is more susceptible to deobfuscation. Base64 obfuscation is another obfuscation method that requires skript-mirror and skript-dev36+ to be installed and combined obfuscation, as the name implies, combines classic and base64 obfuscation.The obfuscated skript will be saved in the directory you ran the obfuskator program from and will be named "obfuscated_<original file name>.sk" (feel free to rename it) The obfuscated skript is now ready to be used, you do not need any extra dependency plugins on your server, simply put it in the scripts folder like any other skript. The jar obfuscation option will further protect your skript by obfuscating it and encapsulating it in jar (since it's a jar but still a skript I like to call it a skar). 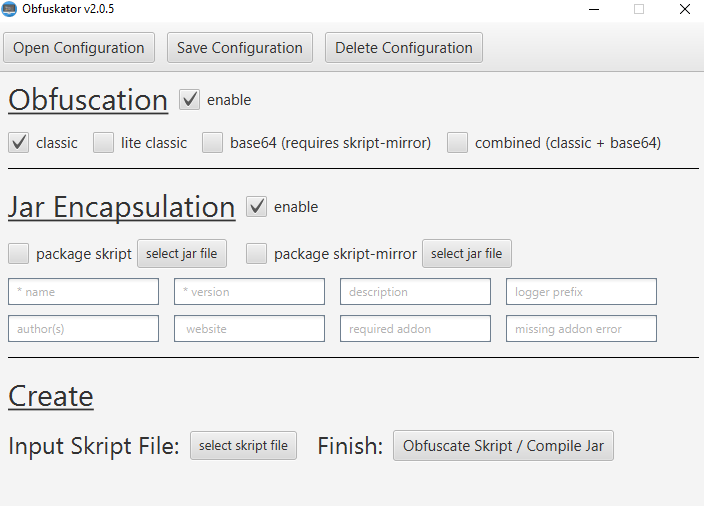 You also have the option to package Skript and/or skript-mirror with your skript. When the jar is run the Skript Runtime Envrironment and Mirror Runtime Environment (SRE and MRE respectively) will be initialized. Distribution will be streamlined and your skript will not be exposed in the scripts folder and your average skript thief won't know how to extract the skript source from the jar. If you do not want the skript to be obfuscated there is an option to only encapsulate it in a jar. You can include as many skripts in a single jar as you would like. - For classic obfuscation, your skript cannot have options. Remove them before obfuscating. - Because of the jar encapsulation feature, you must have the JDK installed to run the obfuskator program. I'm sure you all are capable of installing it but in case you're lost here's a guide. - I tested different skripts as thoroughly as possible but I may have missed a case where the obfuscation breaks the skript. Please report issues in the discussion tab. Klafa, asdf1234, Apahllo and 2 others like this. Works completely, encapsulated in a .jar file and obfuscated! Just needs to permit adding skript modules. This is a best plugin ever! You need to put some money to buy it. Is a very good plugin man! Obfuscating a script does not affect its performance. The only thing that could be affected is parse time. Words failed me! How fantastic the program is! This software will make skript more popular and more amazing! Thank for Author's devotion.Meanwhile may i have your software reposted on the Chinese Forum?Of course i will mark you as the author and attach your donation link to the page. Your favorite cryptocurrency brought to Minecraft! Allow players to view chat in their native language! Broadcast amazing text art messages with one simple command! Quickly fix spelling mistakes when chatting!